the inquiry ordered by the Dhumal regime to look into these appointments. Chief Minister Prem Kumar Dhumal today announced in the House that the government would conduct a high-level inquiry into the irregularities committed during the Congress regime in granting permission for opening vocational training centres. 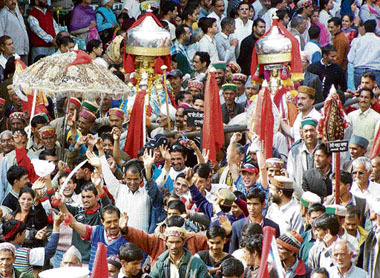 The traditional “jaleb” processions held during the Shivratri fair seem have acquired “political colour” over the years. The Bahujan Samaj Party (BSP) has demanded that all Bhakra oustees families and also other families of oustees uprooted from other power projects in the state should be provided at least 100 units of electricity every month free of charge on the pattern of farmers in adjoining states. The Regional Tibetan Youth Congress condemned the evil designs of the Communist China changing Tibet’s course of history. Leader of the Opposition Vidya Stokes today outrightly rejected the policy of excessive raising of loans to cover the deficit and warned that it would only plunge the state deeper into the debt-trap. The entire Congress group today staged a walkout from the Vidhan Sabha in protest against the “unparliamentary” language and “objectionable” references to former Chief Minister Virbhadra Singh and his MP wife Pratibha Singh during the debate on the budget. Sandeep Bragta (41) and his wife, Kiran (25), died on the spot while their two children sustained serious injuries when their Alto car met with an accident near Tataoli village in Kotkhai today. Power-starved Uttar Pradesh unwittingly protected the financial interests of the fund-starved Himachal Pradesh by quoting a rate of Rs 7.01 per unit in response to the bids invited for sale of surplus electricity during summer. The state government has framed a scheme for payment of pension and gratuity to teachers of government aided and private schools in the state. This was stated by the state counsel before the high court. There is a lot of resentment among hundreds of labourers of 16 gram panchayats under Nurpur development block over failure of the government agencies to release foodgrains to them under the Food for Work Programme a component of Sampooran Gramin Rozgar Yojna (SGRY). The Himachal Pradesh State Pensioners Welfare Association has sought the appointment of a ‘special cell’ in the office of the accountant general (AG) at Shimla to dispose off the pending cases of pensioners and family pensioners. The district unit of the CPI has opposed the decision of the state government to set up six cement plants in the state. It has also opposed the move to acquire agricultural land for setting up one such plant near Sundernagar. The ousted families of the Thein Dam (now Ranjit Sagar) hydroelectric project are up in arms over the utter failure of the government to provide jobs to one member of each family to the remaining 215 ousted families so far. The police arrested Shambhu and Raju Kumar, alias Ranjeet Kumar, both from Bihar, with fake currency from the Barotiwala market last night. Starving the Parent-Teacher Associations (PTA) of grants so that the 15,000 teachers appointed during the Congress regime do not get salaries, forcing them to quit is one of the suggestions made in the report of the inquiry ordered by the Dhumal regime to look into these appointments. The inquiry ordered by the present regime into the PTA appointments has been completed and the report submitted to the secretary, education. The one-man inquiry committee has pointed out that there were no proper rules and regulations in the policy adopted for making appointments through the PTAs, with merit not being taken into consideration. The inquiry has also raised questions on the grant being given by the government to PTAs in schools to meet the salary of these teachers. “The grant should be immediately stopped so that the appointees do not get salaries and quit on their own,” is one of the suggestions made in the inquiry repprt. Questions have also been raised in the report on the formation of PTAs and the government grant being given to them to meet the salary requirement of teachers. With the 15,000-strong contingent of PTA teachers threatening to launch an agitation in case they are removed, it remains to be seem as to what course of action the government will adopt on this contentious issue. “In case the government cancels all PTA appointments, there are many genuine teachers who would be affected for no fault of theirs,” said a PTA appointee. As per the inquiry report, the appointments were made by the three-member committee, which in the absence of any criterion had the discretion to select anyone. It has been pointed out that in some cases not even the formality of holding the interview was fulfilled and the appointment was made by passing a resolution in the PTA, for giving the post to a person. During the inquiry it has been found that in certain places the candidates were not given enough time to attend the interview so as to benefit the chosen one. The BJP had been opposing the decision of the Virbhadra regime to make appointments through the PTAs and it was being expected the BJP on coming to power would order an inquiry into it. In fact, ordering an inquiry into the PTA appointments was one of the first decisions of the Dhumal government. On the other hand the Himachal Pradesh PTA Teachers Association had urged the government to adopt a lenient view and let them continue. They had even demanded that the inquiry into their appointments be withdrawn. Depending on the decision of the government their cases, the PTA teachers could move the court. Intervening during question hour he said there were complaints that permission was granted to private institutes that did not fulfil the prescribed norms. He said if required a vigilance probe would be ordered into the matter. He said the present government was in no way responsible for those who undertook various courses in such centres. Earlier, replying to a question from Randhir Sharma, horticulture minister Narinder Bragta informed that 431 applications were received for opening vocational training centres and permission was granted to 277 applicants. Permission was given on the basis of recommendations of the inspection committee and approval of the government but many complaints were received in this regard. In all 19,880 students were enrolled in these centres out of which 19,202 had passed out. He said those who qualified from these centres were not getting jobs in various government departments as requisite provision had not been made in the recruitment and promotions rules so far. Forest minister Jagat Prakash Nadda told Kudeep Pathania (Cong) that the government planned to enact a tree act on the pattern of Delhi to protect damage to green cover. It would provide for stringent penalties for those guilty of causing damage to trees. He informed that 45 cases of illegal muck dumping on the Shimla bypass road were detected out of which 35 were compounded after realising a penalty of Rs 1,35,650. The remaining 10 cases were being challaned by the local Municipal Corporation. The Forest Department had identified three dumping sites near Bishop Cotton School, Annandale and Longwood nullah. The sites had been handed over to the corporation after approval from the Centre. If required the department would come up with more such sites. Answering a question IPH minister Ravinder Ravi said that all but 840 of the 45,367 uncovered hamlets identified in the 1993 survey had been provided the potable drinking water facility. In a second survey conducted in 2003, 51,841 hamlets were identified and until November,2007, 8,611 had been fully covered and 8037 partially covered. During the current year, a target to cover 4510 hamlets had been set of which 3253 had been covered till January. He said 2000 hand pumps would be installed in drought-prone areas during the next financial year. Replying to a supplementary he said government would inquire into the alleged irregularities committed in the execution of water supply schemes for Shimla, Solan and Hamirpur. Replying to another question Ravi said the second phase of the Rs 243-crore Swan channelisation project had been proposed for funding by NABARD. It would help reclaim 5,000 hectares of land as against 2260 hectare in the first phase. Social justice and empowerment minister Sarveen Chaudhary said that the government would probe the complaints of irregularities against the Ankur Welfare Association, a NGO involved in the ICDS project before taking any decision on its plea for government takeover. PWD minister and Jogindernagar MLA Gulab Singh Thakur, chief guest of the “jaleb” procession today, and Congress’ Mandi (Sadar) MLA Anil Sharma, son of former telecom minister Sukh Ram, were seen walking side by side during the procession. Both of them wore the same traditional “VIP pugris”. On the other hand, BJP’s other MLAs from the area were conspicuous by their absence. As Anil Sharma did not wear the traditional pugri when Chief Minister Prem Kumar Dhumal was the chief guest at the inaugural “jaleb” ceremony on March 7, his wearing that very pagri today became a point of talk in the BJP and Congress circles. What has given credence to the theory of “new political combination in Mandi BJP” is the belief that Gulab Singh Thakur is close to “Sukh Ram and sons”. He was a Congressman before joining the BJP. State unit BJP chief and Chachiot MLA Jai Ram Thakur, Sundernagar MLA Roop Singh Thakur, Dharampur MLA Mohinder Singh Thakur, other BJP MLAs, leaders and members of the Sangh Parivar wore traditional “pugris” during the inaugural ceremony. On the other hand, Congress men and former CM Virbhadra Singh’s fan club took the backseat on that day. The happenings are a clear indication that the fair has acquired a political hue. Even the cultural nights have acquired such a colour. In many cases, the artistes can be seen delivering long lectures thanking VIPs and mela committee members during these programmes. Such a practice sometimes invites flak from the audience. Moreover, the chief guest of every cultural evening is invited on the stage with his men to re-light the “sacred dweep” despite the fact that Chief Minister P.K. Dhumal had already held that ceremony earlier. This is generally followed by VIPs’ introduction with the public. “Such public relation exercises are sheer wastage of time,” said members of the audience who watched three cultural nights during the ongoing Shivratri fair. Districts officials maintain that they have to invite VIPs as the state government gives an ad hoc grant of Rs 50,000 to Rs 1 lakh for fairs like Kullu Dusehra and Shivratri fair. President Kesh Pathania presided over the meeting of the district unit of the BSP here today. It was also addressed by state general secretary Dr Sukhram Chauhan. He said oustees have made sacrifices for the sake of welfare and prosperity of other states by providing them electricity and water and they should at least be given some such facilities in compensation. Another resolution strongly criticised the state budget saying that by only making announcement of adjusting 26,000 youth in services in the state, the BJP government has virtually betrayed some 12 lakh unemployed youths of the state and the government should have come out with an employment plan for these youths, if it was really interested in their welfare as was repeatedly declared by the BJP during earlier elections. The BSP expressed serious concern regarding the increasing prices of essentials and demanded that the BJP should come forward to fulfil its election promise of controlling prices. 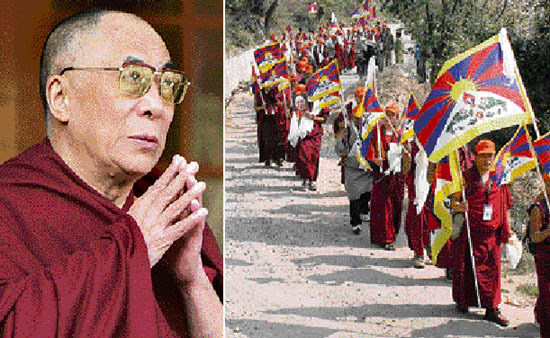 The day is observed as ‘blood day’ because on March 10, 1949, the Chinese in an invasion on Tibet had killed around 1.2 million Tibetans in Lahsa, the capital city of Tibet. The leaders of the Tibetan Youth Congress while addressing a gathering here today said this day was also observed to bring awareness among the Tibetans living around the world. Earlier, the activists of Tibetan Youth Congress took out a demonstration against China in the main bazaars of Dalhousie and burnt the Chinese flag. The demonstrators also offered prayers for the World peace and free Tibet. Initiating the debate on the budget she said the proposals had totally ignored the most important aspect of resource generation and instead opted for meeting the large deficit of 25 per cent by raising loans. It would further weaken the financial health of the debt-ridden state. She also took notice of the heavy committed liabilities of the state which left little funds for development. The salaries and pension of employees, interest and loan repayment accounted for over 70 per cent of the total budget. She suggested that the government should focus on better tax recovery and advocated setting up a separate department for the purpose. The tax collection machinery should be strengthened and fully modernised by using information technology. Besides, proper infrastructure should be provided at inter-state barriers where the tourists and other commuters were put to great inconvenience. She said energy-efficient electric devices should be fully exempted from VAT to save power and efforts should be made to raise the state’s share in various hydroelectric projects. The government should make it mandatory for the industrial units to set up their corporate office within the state so that it was not deprived of revenue. She said there was not much for the unemployed who would have to depend only on the national rural employment grantee scheme of the Centre. She suggested that to maintain quality of works executed under the scheme, a provision should be made for social audit and payments be made though banks to ensure transparency. She also expressed concern over the environmental degradation of hills leading to disasters which caused damage to the tune of Rs 1200 crore annually. It was a huge amount. Urmil Thakur (BJP) appreciated the balanced budget prevented by Chief Minister P.K. Dhumal despite a tight financial position. She said the government had shown its commitment to the uplift of the poor by raising the minimum daily wage and increasing the social security pension. The trouble started when BJP member Dile Ram started reciting a poetry referring to Virbhadra Singh. The Congress members led by Kaul Singh were on their legs protesting against the use of unparliamentary language. They drew the attention of Speaker Tulsi Ram to the fact that the member was not speaking on the budget but indulging in character assassination of the former Chief Minister. They urged him the to expunge the objectionable references. The speaker intervened and asked Dile Ram to speak on the budget. The Speaker said he would expunge anything found unparliamentary in the MLA’s speech after going through the record of the proceedings. However, resuming his speech Dile Ram continued in the same vein and this time he even made references to Pratibha Singh which infuriated the Congress members. They all staged a walkout from the House raising slogans. Dile Ram continued with his poetry in the absence of opposition members and went on to compete his speech on the budget. The couple, belonging to Dalauna village, near Throla, died on the spot when the mishap took place on a sharp curve. The vehicle (HP-52-0524) rolled into a khad, injuring the two children, Janvi (4) and Uddhav (2), who have been admitted to Indira Gandhi Medical College (IGMC) for treatment. Another of their relative, Santosh, traveling in the same vehicle is also stated to be in a critical condition in the IGMC. The accident took place around 1 pm. The three states joined hands and quoted a rate of Rs 5.85 per unit as against last year’s rate of Rs 7.11 per unit. However, their game plan was spoilt as Uttar Pradesh quoted a higher rate of Rs 7.01 per unit. If Uttar Pradesh had not been in the picture like past the state would not have had any option but to sell its surplus power at a lower rate. In case the power was sold at the rate of Rs 5.85 per unit the returns would have been lower by Rs 325 crore compared to last year. However, at the sale rate of Rs 7.01 the loss of revenue compared to last year would be only around Rs 25 crore. The strategy adopted by Punjab, Haryana and Delhi has clearly boomeranged and they will now have to pay a higher rate than the one quoted by Uttar Pradesh or go without power. However, the state electricity board has also been selling its surplus power on competitive rates as well as under banking arrangements to Punjab and Haryana. The board supplies power to the utilities of these states during summer which in turn supply back to it during lean winter months. Last year it also sold a major part of its surplus power to various states on competitive rates to earn revenue of over Rs 400 crore. However, it had to buy more power during winter at high rates. This year it may sell a supply substantial quantum to the neighbouring states under banking arrangement. The state has framed this scheme on the direction issued by the court, wherein Justice Rajiv Sharma directed the state to frame a scheme with regard to pension for the teachers of government aided schools on July 18, 2007. But despite this order the state had not complied with the directions of the court within the stipulated period. Taking serious note of the passive attitude of the state, the court issued show cause notices to P.C. Dhiman, secretary education and one section officer that why contempt proceedings be not initiated against them for not implementing the order. Pursuant to this order, the state framed this scheme and notified the same on March 5. After taking it on record the court disposed of the matter. Earlier, the court passed this direction on a petition filed by Shano Devi for seeking family pension in the event of death of her husband after retirement. Taking it seriously the court directed the state to frame this scheme within three months from July 18, 2007. It is pertinent to mention that this scheme will give benefit the teachers of almost 140 schools government aided schools in the state. CPM activists today staged a demonstration outside the deputy commissioner’s office in protest against the vandalism by RSS activists outside their office in New Delhi. They were led by state unit secretary Rakesh Singha. The vandalism by RSS activists had exposed the communal face of the RSS. These labourers had worked for the rural development works undertaken in these gram panchayts for about one year. The panchayts had been issued foodgrain coupons for 417 quintal of rice and 104 quintal of wheat for distribution among the labourers, eight months back. The workers have not been released foodgrains so far. They have been visiting panchayat pradhans and local BDO office for past many months but of no use. Inquiries reveal that Punder, Batrahan, Hadal, Ther, Milkh, Bassa-Waziran, Talara,Danni, Kulhan, Golwan, Panjara, Khel, Minta, Nerna, Charuri and Hatli Jawalan gram panchayts have yet to get the supply from food and civil supplies corporation for further distribution among the labourers. Zila parshid member Dev Raj, general secretary of up-pradhan association of local unit Ravinder Chowdhary and ex-member zila parishad Pratap Shukla have suspected irregularities in distribution of foodgrain under the Centrally sponsored SGRY and demanded high level probe in this connection. Local MLA Rakesh Pathania in a statement admitted that he had too received numerous complaints about non-release of foodgrains to labourers under SGRY in Nurpur development block. He informed that he was taking up the issue the Chief Minister to ensure justice to the poor labourers. Suresh Jaswal, project officer of Kangra district rural development agency, said he had got detailed reports of the demand of foodgrains under the SGRY from all 15 development blocks. “A compiled report about requirement of foodgrains has been submitted to the state government a few months ago,” he added. In a press release issued here today, P.C. Oberoy, district president of the association revealed that as per the notification of the Himachal Pradesh Finance Department issued on October 17, 2006, the pension of all those who retired from the government service before January 1, 1996, was to be revised on the basis of pension being drawn by them as on January 1, 1996. Oberoy brought to the knowledge of the state government that owing to the skeleton staff, the disposal of pension cases was very slow and rather negligible as numerous cases of revision of pension were received in the office of the accountant general, at Shimla and as such heaps of cases of pension were lying pending. He urged the state government to ask the AG office to expedite disposal of all pending cases as early as possible so that all pensioners, keenly waiting to know about the fate of their cases, could get the complete statement of their pension details. Oberoy also demanded Chief Minister Prem Kumar Dhumal to convene the meeting of pensioners’ joint consultative committee at the earliest so that these issues could be resolved. A two-day district-level conference of the party was held at Karsog. It was attended by around 50 delegates from various parts of Mandi district. According to delegate, setting up such plants was not in favour of the state from social and environmental angles. It was further said that setting up six cement plants would require Rs 4,781.91-crore investment and only 2,700 persons would get employment. On the other hand, the number of persons who would lose their land and houses if these plants came up would be much more. According to Keshav Chander, member of the state executive body of the party, they have decided to start statewide movement against the setting up of these plants. He further criticised the government move of issuing the notice under Section 4 of Land Acquisition Act for acquiring 1,004 bighas of land for setting up a cement plant near Sundernagar. A.C. Verma, member of national council of the Kishan Sabha, presided the conference. He said the CPI would oppose the move of the government on all fronts. Desh Raj Sharma, member of the national executive of the party, also spoke on the occasion. Neither the deserving wards of these families were provided jobs nor the necessary compensation of Rs 50 lakh to each family was paid in lieu of jobs to their wards for the past about 10 years. According to P. C. Oberoy, chairman of the action committee of Thein Dam oustees, the cultivable land of three states -Punjab, Himachal and Jammu and Kashmir- was submerged in the dam waters of the project. After many meetings between the Himachal and Punjab Chief Secretaries at Shimla on July 13, 1998, an agreement was signed under which compensation for the land and houses was to be released to all families. Both were followed by a police team after a tipoff. As soon as they offered a fake Rs 1,000 note to a shopkeeper, the Barotiwala police nabbed them. Later, five and three fake notes of Rs 1,000 were recovered from Shambhu and Raju Kumar, respectively. Both were produced in a court at Kasauli today which remanded them in police custody till March 15. A case has been registered.